Bio-Gro by iSatori review – Do you need it? Any athlete and bodybuilder will tell you that DOMS (Delayed Onset Muscle Soreness) is a serious and painful condition that affects anyone who has done a full workout in the weight room. As I write this review, I am still experiencing some sort of tightness in my legs because of a recent leg workout. Based on my experience with DOMS, nothing, including painkillers, can make it go away completely. But what if a supplement promises to help you manage your post-workout pain? That’s exactly what iSatori promises with its post-workout supplement, Bio-Gro. 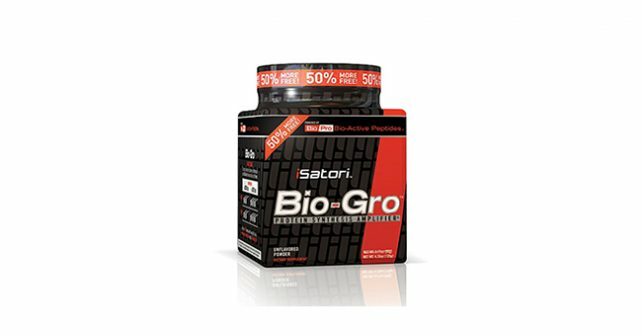 Bio-Gro is a supplement that iSatori dubs as The Game Changer. We’ve seen game changers in the supplement industry with the best supplements for muscle gain like Deer Antler Maximum Strength, and it also has something to do with post-workout recovery. Unlike most supplements that focus on performance enhancement, Bio-Gro claims that it can revolutionize workout supplementation by speeding up the recovery process and reducing post-workout pain. Unlike most supplements that publish their complete supplement profile, Bio-Gro doesn’t. All you will see on its supplement facts is a proprietary blend they call Custom Engineered Bio-Pro Bio-Active Peptiedes Extracted from Micro-Contentrated Colostrum. That’s right Colostrum, aka beestings or first milk. Despite marketing the product as tested banned substance-free, the mere fact that it’s collected from colostrum makes the product illegal in most athletic sporting events. In fact, Bio-Gro was banned by USADA/WADA because of its colostrum content. Bio-Gro attracts a lot of users who want to get rid of DOMS, but its main market is within the cutthroat bodybuilding community, specifically the type of bodybuilders who build muscle without the intention of competing. Since Bio-Gro is a banned substance, it gets a lot of buzz from people who disregard risks over reward. Unlike most post-workout supplements that focus on replenishment of lost glutamine, creatine, and protein stores, Bio-Gro claims to work by amplifying the natural protein synthesis process. iSatori claims that the formula helps bodybuilders recover faster from intense workout sessions. According to the manufacturer, its 1.5 gram serving of Bio-Gro contains the same bio-active properties as 25 grams of whey protein concentrate. It’s a bold statement to make, but if true, it would make Bio-Gro cost about half as much as the usual whey protein concentrate products on a per-serving basis. Bio-Gro can be taken in capsule form or in powder form. Unflavored versions are available for people who would want to mix Bio-Gro with your oatmeal, cereal, yogurt or another powder-based supplement. It can be taken on an empty stomach, and it’s recommended that you take up to 3 servings of Bio-Gro in one day. With a price tag that can reach up to $1 per serving, it can be quite expensive to include into your existing supplement regimen. User reviews about Bio-Gro are mostly neutral, but many are happy with Bio-Gro’s effectiveness in helping to minimize DOMS. Some users report an increase in muscle endurance and performance, while others are skeptical about its real benefit to the user since many are stacking Bio-Gro with other muscle-building supplements. When it comes to supplements, the trust factor is an effective selling point. Since Bio-Gro doesn’t include its actual nutrient breakdown, I find it hard to trust the content of the product. Add to the fact that Bio-Gro misled the public by claiming that it doesn’t have any banned ingredients and it was purportedly tested negative for banned substances, there’s not much left to trust in Bio-Gro aside from several user reviews that attest to its effectiveness. If you’re looking for a product that will speed up your recovery, you can’t go wrong with the best muscle building supplement, NitroGenix 365. NitroGenix 365 contains pharmaceutical-grade nitric oxide boosters to improve blood flow and speed up muscle recovery.